students are enrolled at Ursuline. alumni are eager to welcome students to their professional networks. of Ursuline undergraduates receive scholarships or financial aid. of students living on campus at Ursuline said they felt comfortable and respected by their peer group. 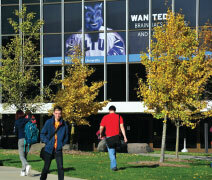 undergraduate academic programs are offered along with nine coeducational graduate programs. is the average class size at Ursuline—in other words, the number of friends you’ll come to know deeply through collaborative work in every class you take. NCAA D-II women’s sports programs are offered, with scholarships available. Learn more at ursulinearrows.com. like-minded student leaders are needed to launch a new student organization on campus, allowing you to customize your campus-life experience. Ursuline students are inspired and determined, accomplishing more than they ever imagined: teaching women entrepreneurial skills in Malawi, facilitating ethics workshops for Cleveland Clinic employees, launching international nonprofits for girls’ rights, earning a seat at the board table for NCAA’s Division II, and scoring in the 99th percentile on the national field test in Psychology are just a few recent examples. Yet Ursuline students have been changing the world with stories like these for more than a century. As an Ursuline Catholic institution, Ursuline College encourages students to take responsibility for their society by accepting the obligation to act in response to unjust or oppressive social situations. Here you’ll upend assumptions, analyze complex situations, facilitate effective solutions, and lead in a world that is increasingly acknowledging the importance of women and women’s contributions. 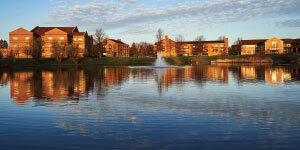 Ursuline is located on 60+ pristine acres in Pepper Pike, Ohio, a beautiful suburb of Cleveland. Cleveland is a city on the rise and home to top-rated restaurants, championship pro-sports teams, world-class hospitals, innovative start-ups, Fortune 500 companies, a thriving arts scene, and so much city pride. We’ve forged partnerships around town, giving students direct access to the best social and professional experiences in Cleveland. Ursuline’s respected programs pave the way to professional readiness. 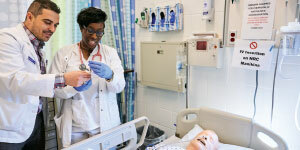 Its premier Nursing program boasts a 100% job placement rate post-licensure; the Historic Preservation and Counseling & Art Therapy programs are the only ones of their kind in Ohio; and the Education programs have prepared highly effective teachers and leaders of public and private schools. At Ursuline, faculty mentorship, research and internship opportunities, and real-word experiences connect classroom learning to students’ futures and the world they’re preparing to enter. Ursuline’s First-Year to Career program helps first-year students select the right major and begin networking immediately through workshops and micro-internships with Cleveland’s best hospitals, nonprofits, and other companies. Ursuline’s residential community has something for everyone. Meals on campus are made from scratch every day and are sustainably and locally sourced through our farm-to-fork program. Ursuline students launch social justice advocacy clubs, travel together on local and international service trips, and even develop their own service projects to earn course credit. A personalized private college experience at Ursuline helps students stretch boundaries and explore possibilities beyond traditional careers, roles, and offerings. The best way to learn if Ursuline is the right place for you is to schedule your campus visit. Register today at ursuline.edu/visit. We look forward to meeting you.